Since I've had several of you ask for steampunk book recommendations, I thought I'd put together a little list. So, if you like Victorian alternative history adventures with dashes of the supernatural, airships, and plenty of gadgetry, read on! Note: I'll just be telling you whether I liked each title one or not, so hit the individual links for more info and plot summaries over on Amazon. This is a fun book, and it's been wildly popular in the steampunk community. It is adult fiction, of course, not Young Adult, so expect the love scenes to be a bit more...adult. But, it's witty and funny and well worth a read. That said, I can't recommend the rest of the series nearly as enthusiastically. I've read the first three, and felt books 2 and 3 just went downhill. The things that happen with the main characters also made me mad. ('Cuz I take my fictional characters seriously, dang it.) That said, if you simply ADORE the first book, then by all means keep going and judge for yourself. If you've read the Uglies series, then you know Westerfeld couldn't write a bad book if he tried. So with that in mind, I'd definitely recommend this book. It didn't grab me quite as strongly as Uglies, but it puts a unique spin on steampunk and has a rich alt-history timeline. This has great reviews, and - in case the cover didn't tip you off - is a steamy alt-universe romance. Hubba hubba. It's on my to-read list, so I'll let you know how it goes! Have any of you read it? How do you like it? So check that out, and then share your own steampunk reading recommendations in the comments! For short fiction, there are a number of good anthologies, including Steampunk and Steampunk Reloaded edited by Ann & Jeff Vandermeer. There's also Extraordinary Engines edited by Nick Gevers. I also published what I think is a very good example of steampunk in my online magazine Lightspeed, "The Zeppelin Conductors’ Society Annual Gentlemen’s Ball" by Genevieve Valentine. I like Steampunk and am just getting started in the genre. Thanks for the book list! Katie Macalister has one, too. Called "Steamed" it's funny, but not as funny as her contemporary books, so keep that in mind. That winged-gear thing on the top of the Leviathan cover looks freakishly like the logo for the brilliant Warren Ellis comic Freakangels. It's available in book form, but you can also read it in its entirety online at www.freakangels.com (to-date, anyway - it's still ongoing, though they say it's almost finished). It's pretty awesome and steampunkish. I am reading the 3rd book in the Gail Carriger series, I am enjoying it but yeah I know exactly what you mean about not liking what is happening with the main characters. They call it "Gaslamp Fantasy," of course, but I still cannot think of steampunk without thinking of Girl Genius (and for the comics-blind, they're now doing novels). If one is happy to have one's alternative Victoriana with fantasy and magic rather than gears and airships, there's little I can reccomend more than Patricia C. Wrede and Caroline Stevermer's _Sorcery and Cecelia_ (aka _The Enchanted Chocolate Pot_). Although in that side-genre, Galen Beckett's _The Magicians and Mrs Quent_ is quite strong as well). Oooooh Goody goody! An excuse to go book shopping! I recently read "Steamed" by Katie MacAlister. She writes paranormal romance, and this is the first of hers that I've read taht didn't involve vampires, dragons or ghosts (all steamy in their own way). Ooohhh, new reading material! Amazon is going to love me this week. It's amazing, and cleverly written, and set in Victorian England. There are demons and angels and vampires and clockwork people. And a little teen angsty, but that just makes it better. Cassandra is a geek girl and proud of it. She has created this amazing world that I just love to dive into. I promise, it's amazing. The Infernal Devices series was really enjoyable. It did really have a steampunk feel to it. I liked it much better than The Immortal Instruments series (to date, that is)...although, the semi-ending in The Infernal Devices felt like a bit of a cop-out to me...(slight spoiler alert) If you only read T.I.D. series on its own, the ending was extremely unsatisfying to me...I really enjoyed all 3 books but the ending where Tessa is immortal and marries Will and their whole life (including children) is summed up quickly and then, after Will dies of old age, Tessa disassociates herself from any of her family (it would be painful to know they will all die) and just roams around on her own...until she meets up with Jem, presumably semi-current day, who has been cured from his original affliction and is no longer one of the Silent Brothers and they just get together again. She gets both the guys? That's how that works? If taken as a stand-alone series, that ending felt very overly contrived and too happy even for me (and I love happy endings). Also, check out Jay Lake's works - Mainspring and its two sequels. They're set on a world where the equator is a giant gear and the solar system is made of clockwork. And they're really well written, with very interesting and well-developed characters. I just finished Boneshaker on Wednesday and do recomend it. I also read another book by Cherie Priest a couple weeks ago Bloodshot. It's not steampunk but I enjoyed it. I liked the other books in the Parasoll protectorate series but I agree the first is the best. Thank you for the other recomendations. I'm always looking for book recomendations and have only recently started in on Steampunk. Oooo! Thank you, thank you for the recs! My hubs just got me a nook, and now I can fill it up with some of these reads! Can't wait! It's been called steampunk so I'm going to recommend "Shades of Grey" by Jasper Fforde. Fforde books are what I would call mega freakin' weird and you either love them or hate them. Thanks for this list! I am saving it to use when I need a new book. I wanted to add one (which I was happy to see is on the link you posted at the end) -- The Anubis Gates by Tim Powers. Awesome page-turner. Hope you read and enjoy! 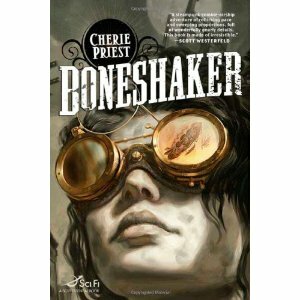 I read Boneshaker and was horribly disappointed. The writing was AWFUL, and I hated both of the main characters, neither of whom were well-fleshed out or likeable. It kind of felt like the author went, "Hm, what do people want in steampunk stories? Goggles and zombies and airships!" and then proceeded to somehow make the most boring story possible out of it. Seriously, these are the lamest zombies ever. Don't waste your time reading it, Jen! Oh, no, no, no. Must stay away from steampunk graphic novel website. Do not click link. Resist! Resist! I loved reading the Parasol Protectorate, but you're absolutely right it did go downhill by getting more ridiculous in the 2nd and 3rd books. I kinda like the ridiculousness though, it made it more fun to read. Have you read the steampunk webcomic Girl Genius (www.girlgeniusonline.com)? it's a really fun read and the authors have won several awards for it. They also just came out with a book which unfortunately I haven't had a chance to read yet. I highly recommend Boneshaker. There's a second one, Dreadnought, that I haven't read yet. As a fan of the Uglies, thanks for the Scott Westerfield recommendation. I wasn't aware he'd written any other books! Soulless is a lot of fun. I enjoyed the 2nd book, Changeless, but not the third. I felt nothing really got accomplished. She's ending the series soon and will be starting a Young Adult series. Boneshaker is one of my faves. I've read it multiple times now. I was lucky enough to get a copy of Clementine, which was limited run and really enjoyed that. It's supposed to be a series. Dreadnaught was good, too. Cherie Priest also started a new series with Bloodshot. It's not Steampunk, but it's still good if you're into Sci-Fi/Urban Fantasy. I'm reading The Iron Thorn by Caitlin Kittredge. At around 200 pages in, it's the best steampunk novel I've even read! I am rather surprised you have not read Gibson and Sterling's The Difference Engine. It's a fantastic story, whether one is really into steampunk or not. But to me, it has one of the best realizations of a steampunk world. Girl Genius online comic is awesome. Even if I am not a comic book reader either :) That was my first introduction to Steampunk. I can't wait until people give their opinion on that graphic novel, it looks AWESOME! And steampunk romance... sounds like the most perfect summertime reading on the beach book EVER! Soulless was a lot of fun. I enjoyed the 2nd book, Changless, but the 3rd didn't do much for me. She has 2 more in the Parasol Protectorate series, then she'll be starting a Young Adult series. Boneshaker is one of my favorites. I was lucky enough to get a copy of Clementine which is the same Clockwork Century series, but was a limited run. Dreadnought was a lot of fun, too. She wrote them so you could pick them up at any point, but I would still read Boneshaker first. She does explain things in Dreadnought, but I felt I enjoyed it more because I already knew what was going on in their world. Cherie Priest has started a Sci-Fi/Urban Fantasy series that is also very good. Bloodshot is the first in that series. George Mann's The Affinity Bridge was very good too. I love Cassandra Clare's Clockwork Angel. It's YA and the companion book series to her Mortal Instruments books (the fourth one just came out!!). They all are really great reads! Thank you, thank you, for compiling this list... I'm excited to look into the other titles! Oooh, I'm going to have to check those out. BTW, I gave your blog an award. oohh i am blanking on the rest of them!!! but thanks for these recs!! 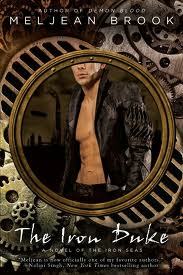 An awesome steampunk romance is "Clockwork Heart" by Dru Pagliossotti (I think I spelled that right...). SO fun. Also, Gaslight Dogs by Karin Lowachee is sort of a hybrid steampunk/Arctic fantasy. Really interesting book! Your blog introduced me to Steampunk (I have been reading Epbot since day one, but this is my first ever comment) but I wondered if you have ever read Incarceron or its sequel Sapphique? They are young adult novels and they are my first venture into the genre. Clockwork Angel by Cassandra Clare is decent. Nothing spectacular, her writing remains only average, but good if you want something fun to read. 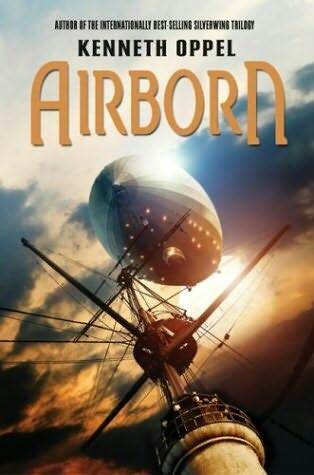 For a book that has a ton of awesome steampunk elements (an incredibly complex living machine culture, for example) but lacks a little on plot, check out Stephen Hunt's The Court of the Air. You ought to read Incarceron! I just finished it and loved it. It's set in the distant future and has a kind of science fiction vibe to it, and a bit of a fantasy feel too, but it's really steampunk. It's about a living prison, some of its inmates, and the warden and his daughter. Very good; not sure I've ever read anything quite like it. Haven't read the second one (Sapphique) yet, but I'm dying to. I love, love, LOVE George Mann's Newbury & Hobbes series! It all starts with the Affinity Bridge, with dirigibles, automatons and zombies (AND a gorgeous cover, btw), then there's The Osiris Ritual, with mummies, of course, and this Summer The Immorality Engine comes out. They may not be the most profound and world shattering books, but it's FUN. Not ha-ha funny, but a nice, most entertaining steampunky romp. I agree on Carriger's Parasol Protectorate and Westerfield's Leviathan series. Boneshaker wasn't bad but I could not figure out how it was classified as young adult. There's lots of violence and bad language. You should give Richard Harland's Worldshaker and Cassandra Clare's Infernal Devices series (Book 1 is Clockwork Angel) a shot. This post and the comments are amazing :) I'm a steampunk obsessed high school library assistant, so of course I'm doing a huge display to try and get all the kids hooked. Thanks for adding tons of titles to the list I wanted to feature everyone! I actually just bought Soulless lately, it's on my TBR (to be read) list right now, just haven't had time to get to it yet! I can't believe no one has mentioned Phillip Pullman and the "His Dark Materials" books. The first one (The Golden Compass_) is especially steampunk-y. Don't let the terrible movie fool you! I have heard, but haven't read, that _Android Karenina_ (in the same vein as _Pride and Prejudice and Zombies_ and _Sense and Sensibility and Sea Monsters_ is a steampunk retelling of Tolstoy. There's also The Glass Books of the Dreameaters. It's actually mentioned in the link you provided at the end of the post.. It's a bit difficult to read at times, but it's quite good. There is also a movie being made in 2 years.. I thought the Golden Compass was the very essence of Steampunk. The alternate universe that Lyra lives in is. I'll be in Seattle with my hubby for the week. While he's in meetings, I intend on relaxing and reading without worrying that I should be doing something productive. I loved Boneshaker and Dreadnought. I read Boneshaker first, and silly me, didn't realize Dreadnought was a sequel. There was a moment toward the end when all the names that had seemed so oddly familiar clicked in my head, and I yelled "OH! It's a SEQUEL!" LOL. I do think that the zombies in Dreadnought are somehow more horrible than the ones in Boneshaker. I think she gives more detail both to what they look (and smell) like and also how they got that way, than she did in Boneshaker. Both are great though. Also, adding to the Girl Genius and Freakangels love. :3 Both are award-winning and free! I don't know a huge amount about steampunk but the books that first introduced me to the idea were the Mortal Engines Quartet by Philip Reeve (Hungry City Chronicles in the US). I really enjoyed them and the idea of airships and traction cities really captured my imagination. I enjoyed the second Parasol Protectorate book but the third really didn't do anything for me. I am hoping it picks up again, because they are fun when she gets it right. The Court of the Air by Stephen Hunt is good. Also, don't touch Katie MacAlister's Steamed with a barge pole. I could not finish it, the characters drove me up the wall - classic don't judge a book by it's very pretty cover. It's also that steampumk is trendy so everyone she's crossed over from her usual genre to have a go, and it shows. The Unicorn series by Tanith Lee is very steampunk-y. There are three books, The Black Unicorn, The Red Unicorn and The Gold Unicorn. They're YA books, I first started reading them in middle school, but even as an adult I still enjoy them. Definitely an interesting series to read in a row. Boneshaker is okay. Not great. But I don't like stories where main characters are children. One really good one I've read is a children's book called Larklight. For something a little more grown-up(like pg-13 instead of g/pg) there's a web comic called Girl Genius that's really awesome and was my first exposure to Steampunk. Oh man. i LOVE levithian! i knew it would be on this post after i read the title. :) it has a sequel, behemoth. pretty good stuff! If you want a truly unique couple of books, try Zeppelins West and Flaming London by Joe R Lansdale. They are bizarre and crazy, but well-written and the most imaginative books I have read in a long time. I agree with The Iron Duke. I approached it hesitantly but I loved it and can't wait for the next one! Of course, for anyone who is unsure (like I was), a library is a great resource. I hate spending money on books that I end up disliking. This Etsy seller is right up your alley! I have to third or fourth or fifth the Girl Genius recommendation. Plus, if you follow Kaja's LJ, you'll see some of her more awesome steampunk/victorian/gaslamp finds and decor. I'm not talented enough tonight to read 61 comments, so I'll just say, that to get your kids started in Steampunk... The Series of Unfortunate events rocks. Ableri to read, therefore I am happy. I have to second the recommendation for Philip Reeve's Mortal Engines series. Airships, pirates, traction cities... awesome. And I'm halfway through Boneshaker at the moment, and I'm loving it. Chiming in to add my voice to the choir of GirlGenius fans. ^_^ The webcomic is updated 3x a week, but if you can get your hands on the books... WOW! There is so much amazing detail on everything!! I cannot say enough good things about James Blaylock and Tim Powers (they write other things beside steampunk though). Tim Powers wrote a book that I suspect the writers of Pirates of the Caribbean realied heavily on- "On Stranger Tides" Pirates, puppetmasters, zombies and the fountain of youth- not quite steampunk but very good alternahistory. Try Kage Baker's Comapny series- while not strictly steampunk, "In the Garden of Iden" features cyborgs in Elizabethan England, later books take in secret Vicroian societies, California before the Goldrush and Pre-columbian Americas. My fiance's got Boneshaker and he LOVED it. Allow me to Give another Raving review for George Mann's "Affinity Bridge" and the 2nd book, "The Osiris Ritual" (3rd in the series coming out in September!) Newbury and Hobbes are Wonderful. Hobbes is a strong, thoughtful Victorian woman who's not afraid to hike up her petticoats and bust down a few doors. I hopped over to the comments to recommend China Mieville's Bas Lag universe books--Perdido Street Station, The Scar and Iron Council--but I see that Perdido Street Station is on the 20 Core Titles list. Can't recommend those enough! I went from having no idea who Mieville was (aside from the namesake of Dora's cat in Questionable Content) to having read all his books in a few months. Warning, though--Perdido Street Station is creepy. He creates some wonderful monsters. I had nightmares. The other two were fine. I really liked Boneshaker, and I'm not really into steampunk lit (steampunk design, sure...but not so much on the lit.) Now that I know there's a sequel, I need to go hunt it down. I liked Soulless, but I thought Boneshaker was awful. Definitely the worst book I read last year. There's a big difference between the fantasy Neo-Victorian and the more grungy, "Dickensian" Neo-Victorian. The Difference Engine? Grungy. Boneshaker? Grungy. Girl Genius? Fantasy. China Mieville's Bas-Lag? So raw it scratches and pours in the lemon juice. I liked Boneshaker but got bored with Girl Genius. Some people love GG but were turned off by BS. They're both worth a try! Boneshaker was definitely disappointing. The world was interesting, but the writing was TERRIBLE, and I really didn't care whether the characters lived or died. But without a doubt, go read Girl Genius. Now. Seriously. Gorgeously drawn, interesting and hilarious. One you may not have seen yet is Native Star by M.K. Hobson. Magic, Steampunk, Monster mashup. Lots of fun. Also, What about Johann Cabal, Necromancer? I was hesitant to read it, but it was snarky and funny with definite steampunk leanings. Hmmm, I had pretty much the exact opposite reaction to Uglies and Leviathan. To me, the Uglies series had very few likeable characters (the only person I enjoyed was Shay, who spent most of the time being the villain), and he seemed to run out of story after maybe the first to. Leviathan caught me completely, and Behemoth is even better. It's not a book, but have you ever seen Dragon Hunters? It's a French animated film, but they made one with American voice overs. The animation is stunning! It's on instant play on Netflix right now if you're a subscriber. I'd definitely recommend it for the visuals alone. +1 for Girl Genius. I'd say it's definitely steampunk (although much more vivid and vibrant than many steampunk interpretations). I read Boneshaker and it is fun but rather fluffy. I much preferred the sequel Dreadnought-- I liked the character better and the action was more interesting to me. Thank you for posting all these books-- they look fabulous and I can't wait to check some of them out. I am a long time lurker - love your steampunk posts as my husband and I plan an annual steampunk art exhibit in Connecticut. The author is a friend of mine and my husband's (the famed Dr. Grymm) and we have heard about her process of working on the book for some time. This has nothing to do with steampunk, but the t-shirt for tomorrow on www.teefury.com is a Firefly one. They only sell shirts for one day, so you might want to check it out. GG = great. So much love. Larklight is also great, thouhg the sequel isn't as god. Jane Irwin has two very steampunk bits. Google her! RPGS: Eberron and Spelljammer for D&D settings. Castle Falkenstein and Space 1889 for stand-alone RPG settings. I liked Stephenson's The Diamond Age. Optimistically dystopian, IMHO. To all the above: YES! Flora Segunda by Ysabeau S. Wilce, California empire steampunk with magic. The kids and I dearly love the Larklight series by Philip Reeve, aimed at a younger, sillier audience than the Mortal Engines. Girl Genius is amazing and worth a read, and Scott Westerfield's work is great across the board. 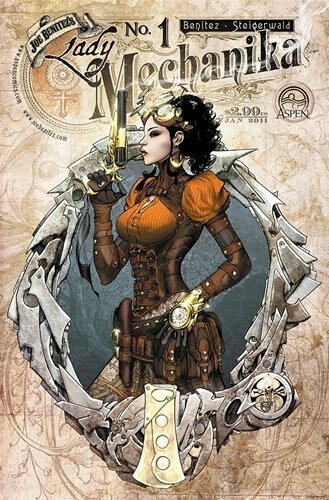 Lady Mechanika has only had one issue, is MONTHS behind on it's second issue, and it totally out of the first print run. If you can find a copy of issue 1 snag it, it's decent enough, but you're not likely to find a second copy. We have a steampunk weekly web serial as an introduction to our range of books here: http://inaristeam.com/category/scottie. It's a take on the dime novel genre, is much higher adventure than the rest of our line, and is free to read online! Boneshaker is great! I started reading for the zombies and pirates, and kept reading because I became wrapped up in Briar's story. You should definitely check it out! On your Soulless comment: "I've read the first three, and felt books 2 and 3 just went downhill." I could not agree more. The first one is definitely the best but the other two are eh...not that good. Another good YA series is The Hungry City Chronicles. Well written characters with enough adult humor to keep older readers entertained. 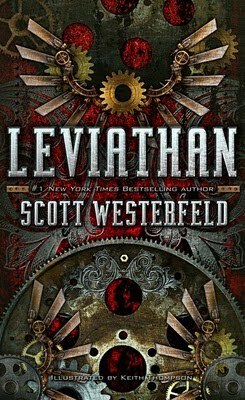 Leviathan is my FAVORITE book of ALL TIME. It's amazing~ I'm really glad that you had it on your list!! Goliath (the third book in the series) is coming out in September, just fyi! I'd have to add Randall Garrett, too. He was one of the early writers of steampunk. His Lord Darcy series rocks! It's not out yet, but you should read "The Girl in the Steel Corset" when it comes out later this year. YA, steampunk, a bit of romance -- I really enjoyed it! "Steampunk Prime" is an anthology of Victorian Sci-fi stories - the original steampunk and very interesting. For those who don't mind a dash of rather politically-incorrect in places fantasy in their steampunk, S. M. Sterling's "The Peshawr Lancers" is a galloping read. Girl Genius all the way!! I've heard so many mixed things about Boneshaker. I don't know, I'm hesitant. I follow Felicia Day on there - and though I read a lot, she makes me feel like I read nothing at all...it's nuts. And no Girl Genius on your list! Incarceron is an amazing book. I can't remember the author name though. ): It's about people who are far more advanced than we are but are forced, under a decree by the king, to live in the 1800's. Technology is banned but hidden. And...mevermind. Just read it. I just remembered, it's by Catherine Fisher. If you love steampunk you MUST read philip Reeves Mortal Engines quartet. Set on a post apocalyptic world where the principles of municipal darwinism means that huge cities on wheels chase and eat each other. There are blimps, secret organizations and zombie/robots. You really have to read them. SO, I've read over 1,000 books in my lifetime and nothing has kept my attention like Girl Genius. It took me a few days but I've read everything online so far! I had never even heard of it before reading the comments. Amazing series! I wasn't crazy about Leviathan, but I did like Behemoth. I didn't like Leviathan because it left me hanging so bad! Only when I found Behemoth did I realize it was a series... blonde streak... again. Keep 'em coming! I just read my first steampunk anything - "The Alchemy of Stone" by Ekaterina Sedia. It's categorised as Urban Fantasy/Steampunk - it was shelved in the sci-fi/fantasy section in our local library, and I was expecting something a bit more Fantasy - it seems very steampunk (to a novice who only heard of steampunk through this blog). It was pretty gripping and well written, very interesting subtext of social commentary too (quite an interesting kind of feminist leaning, as well as including robots!). However, without spoiling anything I will say that if you're a fan of a happy and/or conclusive/resolved ending (as I am), you will be EXTREMELY disappointed with the way the book ends (as I was) - it was quite a let down (to me) given the promise of the book. Having said that though - if your criteria is just steampunk - you'll probably enjoy it a lot. Soulless and Leviathan (and the assorted sequels) are my current favorite books. No joke. I didn't like Boneshaker as much, but I admit to not finishing it. Yet. having just finished the first one myself I strongly recommend Cassandra Clare's Infernal Devices series. they are stand alone complimentary books to her mortal instruments series and the second one Clockwork Prince comes out in Dec. lots of really cool steampunk stuff that she loves to write about. Her website for the series is worth a look too! I can't wait to start reading some of these books. Would you call any of them dystopia? If so, they'll rocket to the top of my reading list this summer. 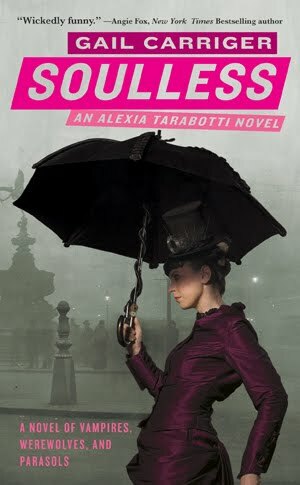 Thanks for reccomending Soulless... Of course I began reading it months ago, but currently I'm in the anxiously-waiting-for-Timeless phase.